How did I do in 2014? Reflecting on this year's goals. At the beginning of the year, I set fourteen goals for my collection and the blog. Let's review all of them and summarize my successes (and failures). 1. Reach 65% on my Japanese type collection. I was at 56% at the beginning of the year, and now I'm at 53%. As far as the list at the beginning of the year goes, I have passed 65%. But a new guide with dozens of new older sets was released, and I also updated my lists from 2008-2013 with better data. I'd consider myself successful in improving my type collection. 1b. 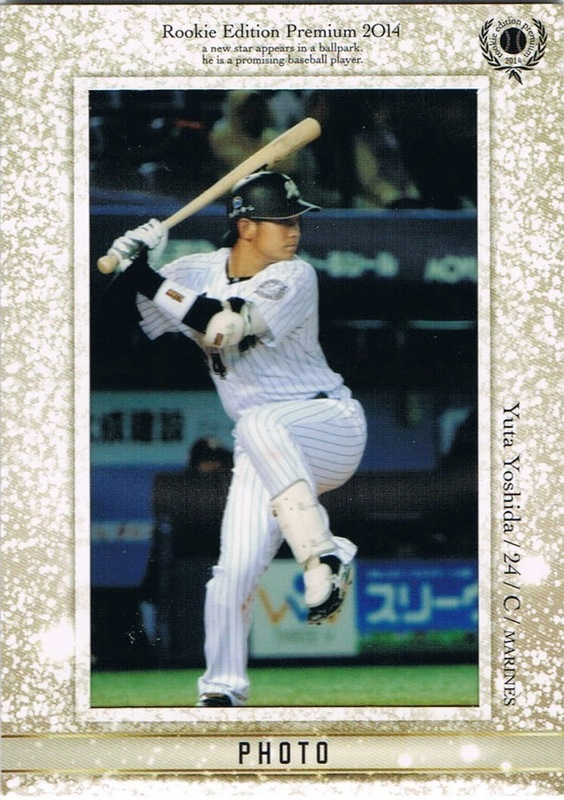 Find the last fourteen Calbee cards for my type collection. I now need 46 cards for my Calbee type collection, thanks to the guide and research on some very rare sets. No good. I didn't really get a chance to Calbee hunt, either, so it's not like I made much progress on the first fourteen. 2. Complete the Calbee Through The Years post series. Well, I didn't get past the 1970s. 2b. If I meet my second goal I'd like to do the same idea for BBM. 2c. Finally, I created a framework for a table of contents/index for my set posts, but I'd like to refine it and post it to the blog. It's not published, because the Calbee posts were pretty much put on the back burner. But I've been building the index page. 3. I want to do better with my new release posts. I'm not too far behind with this year's posts. I think I missed a couple, but I really posted a lot of details on the new sets as they were released. 3b. I'd like to bring back the previews and reviews of new MLB sets. I tried this at the beginning of the year, but I quickly tossed it aside. 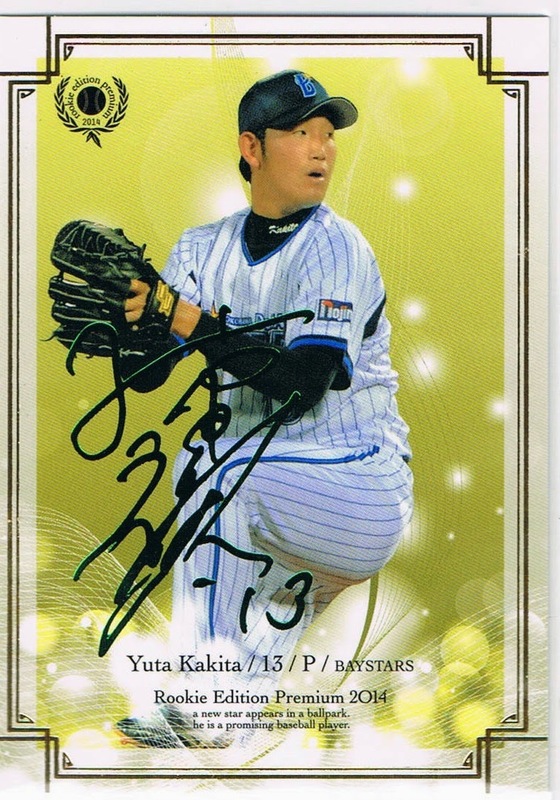 Getting MLB cards in Japan is not easy or cheap, and I just can't get interested in something I can't actually hold. That said, I haven't abandoned my MLB collections, far from it. 4. Do something with Cardboard Zoo. I haven't touched the site all year. However, my new release posts here for Japanese cards would be something I'd probably post on the Zoo. The spirit stays alive, though the content is now here. 5. Finish my NPB Live Game Collection. I finally got this collection completed early in the year, and the single NPB game I went to this year was updated pretty quickly! 5b. I'm not really ready to start the MLB version of this collection, but I want to start creating a checklist. Not only did I create the checklist, I went through the generous stash of cards in my collection from Kenny (Zippy Zappy) and others to knock a sizable percentage of the names off the list! There are 2321 total items on the list, of which I already have 543! Not bad for a random pile of cards mostly issued in 2012. I have almost all of the sets I want from this year's releases except for the flagship Topps set and Update, and Stadium Club. I've been trying to find a good deal for each of those, but have been unsuccessful. I need some SSPs from Goodwin Champions, too. 6b. I'll build some insert sets from 2014 too. almost all 2014 Donruss Diamond Kings cards I have #29. 7. Post more details about Japanese card shops. I published a few more card shop posts, and I built a few pages to be published in the future. I'd say I was pretty good here, though there is more I can do. 8. 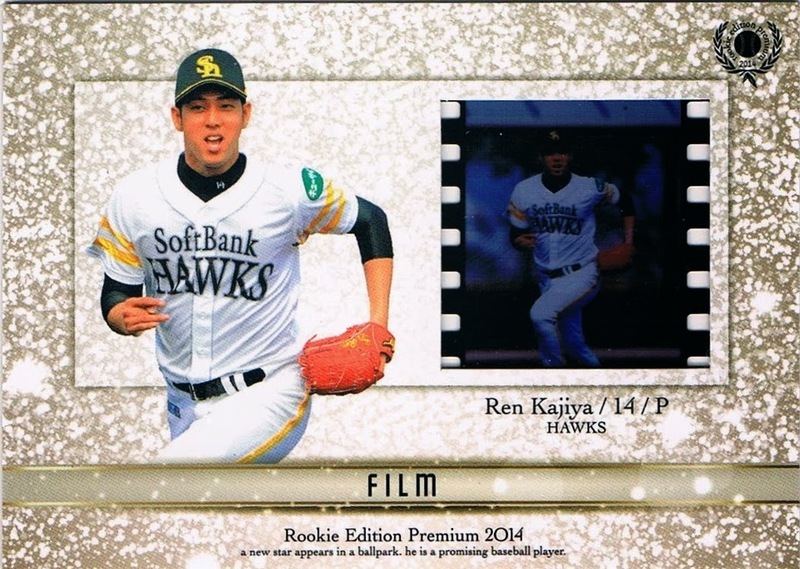 Finally, I want to post about the various awards and their winners in NPB. I didn't get here. My Awards collection is about as complete as it can get, other than the 2014 winners. But I didn't get any posts written. There were fourteen goals for 2014, of which four were complete failures. Three were partially successful, and two of those could be completed with a bit of cash or time. That means I was fifty percent for the year. With my ambitious goals I'm not surprised that I couldn't finish them all, but I was hoping to at least get a C grade. There were other major accomplishments that I managed this year, too, though. I reorganized my set inventory spreadsheets, combining all the sub-collections into one big master sheet. I dove head-on into my player collections, and murdered the list! I also added two players to the list and made major gains for both of them. I mentioned this already, but I did some major updating of my Japanese type collection lists. I've scanned all of the cards in my Japanese sets, front and back. I photographed all of my souvenirs and collectibles. I'm happy with the way 2014 turned out in my hobby! What will I aspire for next year? BBM enjoys using team's anniversaries as excuses to release sets with lots of retired players. 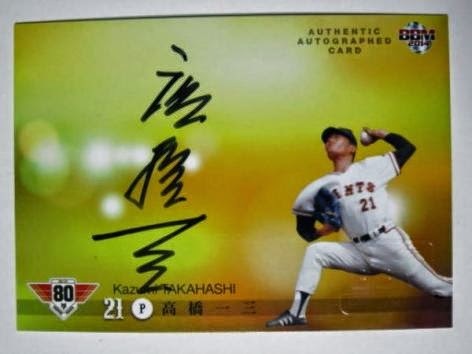 With the NPB celebrating professional baseball's 80th anniversary in 2014, the Giants have also reached their 80th anniversary. The set starts off with a six-card "History of Giants" subset, outlining the team's annual records, year by year. It's interesting to know that the team went from a record of 2-5 in 1936 to 30-9 in 1938. Note that each year was split into two seasons until 1939. Cards 7 to 75 are OB (retired) players with orange borders and backs, and 76-90 are active players with blue highlights. 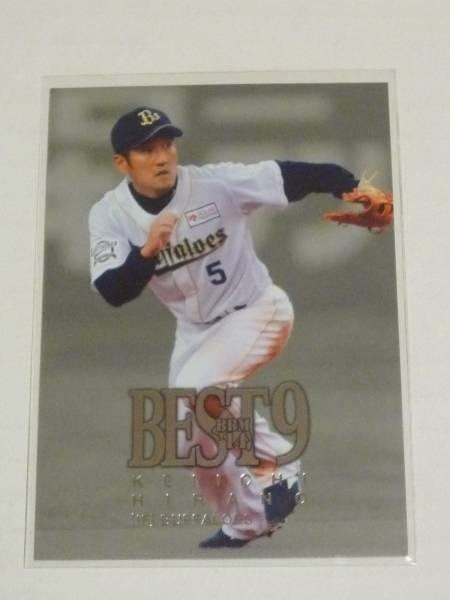 These are pretty standard as far as BBM's player cards go, though some very old players show up in the checklist, with some interesting photos, like Mihara's. I'm happy with older grainy photos occasionally like this to get more historic players in the sets. Some of the other photos are amazing. Cards 91-99 are Team Record cards, showing nine statistical categories and the top 10 Giants. I don't like the background design on these; I wish they had done something similar to the other 80th anniversary sets they issued. There are three parallels for the base cards (OB and active). Gold foil signatures are numbered to 100 copies, holographic foil signatures 50, and green signatures are limited to 25 copies each. The twelve-card standard insert set is titled Giants Heroes, with a GH prefix on the card number. The inserts are exactly as you'd expect from BBM - a cropped photo over a background, with no details on why that person is a Giants Hero. There are two parallels of Giants Heroes: gold (#/200) and holo (#/100). I count thirty subjects on the OB autograph checklist. These appear to be mostly on-card, though BBM identifies three players with sticker cards. print runs are 30-100 copies each, though most players are near 100 copies. The sophomore issue of BBM's Classic throwback issue is certainly an improvement over the first release, though there is one major issue that I'll discuss later on. 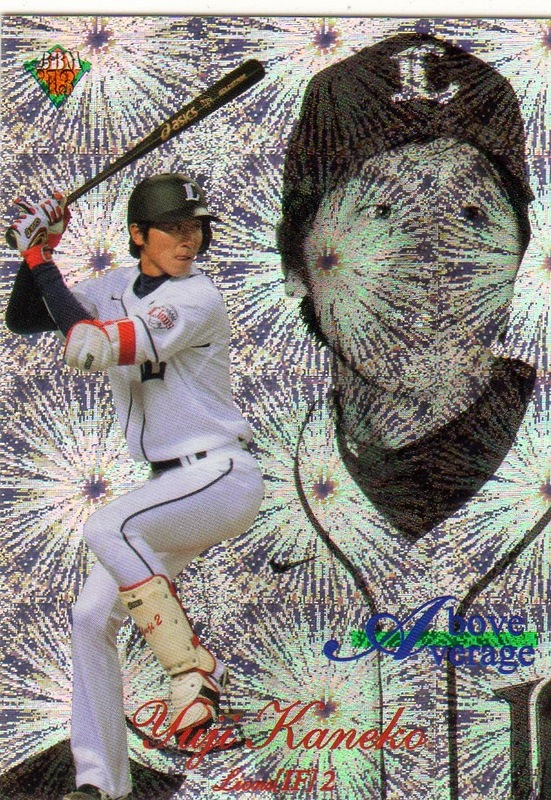 The base cards unsurprisingly use the 1992 BBM design for active players. The backs are purple-tinted and I believe include career statistics. The retired (OB) players have a brand new design, though it has hints of some of the designs BBM has used in the past. It's a very nice look. I'd like to see BBM bring back the base design from Nostalgic or Century's Best Nine for a future release. There are 108 cards in the complete set, 72 active and 36 retired. No parallels were inserted into this issue. All insert sets (below) have 12 cards in each checklist. The only accessible insert set is Best 9, which borrows from the 1997 set of the same name. Next are Pitcher Perfect and Above Average, inserts originally from the 1999 Diamond Heroes premium set. There are two versions of both sets: a regular foil version #/50, and a firework holographic foil #/25. The other insert set, Run Producers, copies the 1996 insert set of the same name. These are limited to 100 copies each, and do not appear to have a parallel. 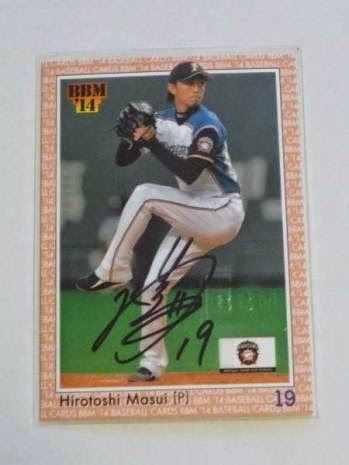 Thirty three subjects signed for the regular autograph set, which uses the base card design with sticker autographs. These should be numbered (10-105 copies each) and have a BBM embossing. There is also a buyback autograph set, with 25 cards. Print runs for the buyback autographs range from 3 to 35 copies. Rounding out the release is a pair of jersey cards using the design from the 1998 Diamond Heroes set. Card 1 has a print run of 50 copies, while card 2 has 100 copies. There's a lot to like about BBM Classic. Like Topps Heritage, it's a way to see modern players on classic designs. BBM doesn't have the history of Topps, but it's fun to see throwback designs used occasionally. I am going to collect the base sets at least. 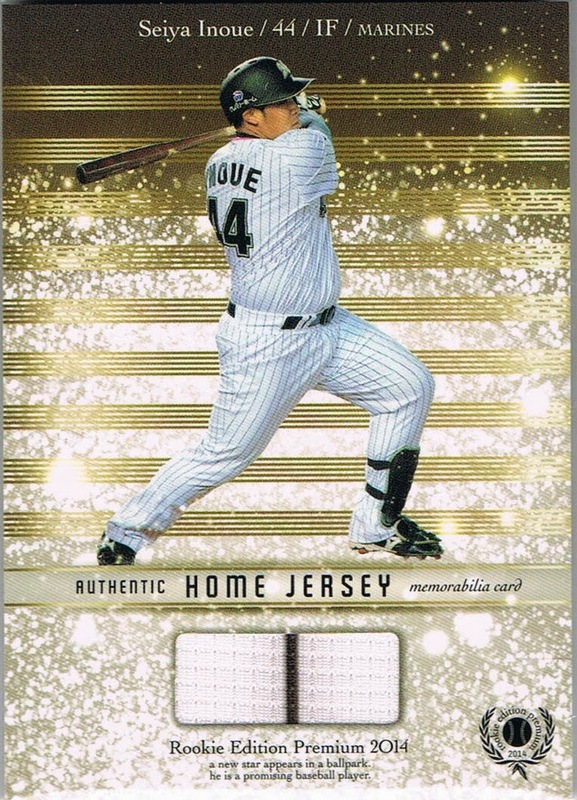 However, the insert sets are a big draw in this throwback release, but they're virtually impossible to get. Auction prices are quite high for singles other than the Best 9 set, so I don't know if or when I'll be able to get any. It's nice that BBM isn't flooding the market with tons of inserts, but the super-low print runs make these quite tough to collect. I do like the inclusion of multiple insert sets, and as long as BBM doesn't start over-reusing designs (like Topps does with Archives and all their insert sets) the Classic brand can remain attractive. Rookie Edition Premium is an annual late-season/postseason boxed set that serves as a follow-up to the pre-season pack based Rookie Edition. This year's gold-themed card uses a 3D wave design at the bottom with little white stars in the background of the cropped photo; cards have a nice frame border. Backs have basic statistics for 2014 through about mid-September along with the rest of BBM's usual inclusions. Cards are numbered in the upper-right corner. REP has a subset titled Golden Hope, with two photos on the front and back of the card, and not much else. These are numbered in the top-left. The full base set has 48 cards - three regular cards and one Golden Hope card per team. Each box also has two premium cards. One of those premium cards could be a green foil signature card, which might exist for all 36 cards in the regular base set. These are numbered out of 25 copies each. There are 21 players with autographed cards in the set. All 21 players have vertical and horizontal versions, with print runs ranging from 3 copies to 80 copies. The vertical autographs are rarer than the horizontal autographs. Nine players have on-card autographs, with the rest using stickers. 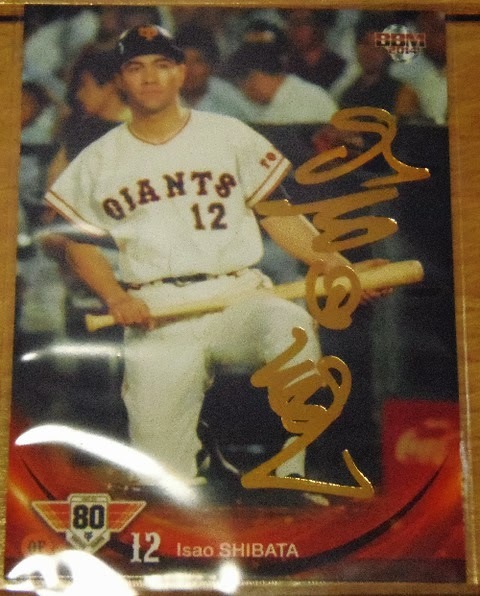 Memorabilia cards were included for ten players. Jersey cards have a print run of 330, with the one undershirt card having a print run of 256. The jersey cards have patch versions #/20, with the undershirt patch being #/2. 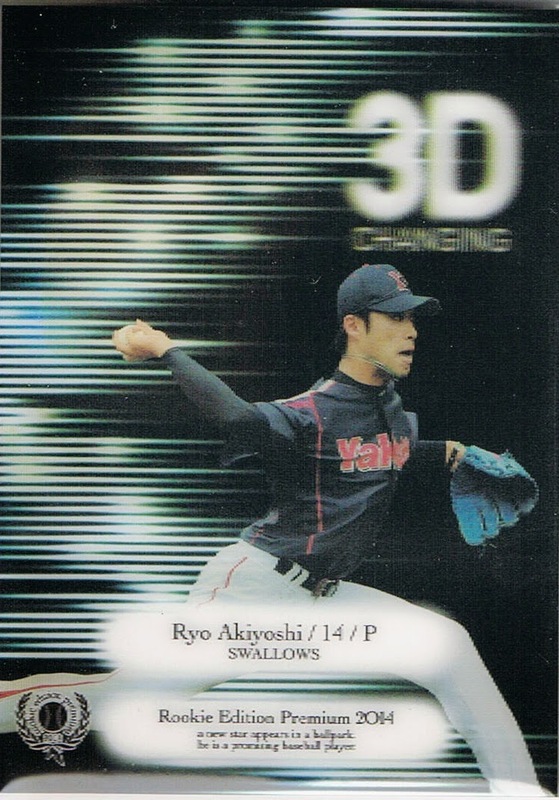 Each team has one card in the 3D Changing insert set, which as it sounds is a 3D card. These are numbered out of 50. Photo cards are back, which are just framed cards like Gypsy Queen uses - I don't understand the hype. But they're numbered out of 75. There are thirty six cards, one for every player in the regular set. I think the Film cards are a bit cooler, although I've never been able to find one to add to my collection. It doesn't help that they're numbered out of 25. Again, this checklist parallels the regular set with 36 cards, one per player, three per team. Unlike Bowman in the US, with about 10 different products, the Rookie Edition line is limited to just the regular and premium versions. I've been quite busy lately, so there haven't been too many posts. I've managed to get some projects done, and waste a good bit of time doing nothing too. My Monday excursions have been quite lengthy lately, as I've spent more time exploring some of the shops of Akihabara. I recently returned to the Akiba Cultures building to check out the new shops; K-Books had moved out a few months ago and a couple other stores took its place. One shop that's been in there for a while has a ton of J-Pop and K-Pop goods, especially paper goods like posters and books. There's a small trading card corner, which had several very cheap relic and autograph cards. Now 26, Mai Endo is best known for her role in the pop group Idoling!! !, which I've discussed before. She was the lead member of the group after the two senior members left in 2009. Mai "graduated" to a solo career in 2013, though I'm not sure how successful she has become. In 2011, though, she was fairly important in the J-Pop idol hierarchy, important enough to receive her own card set. 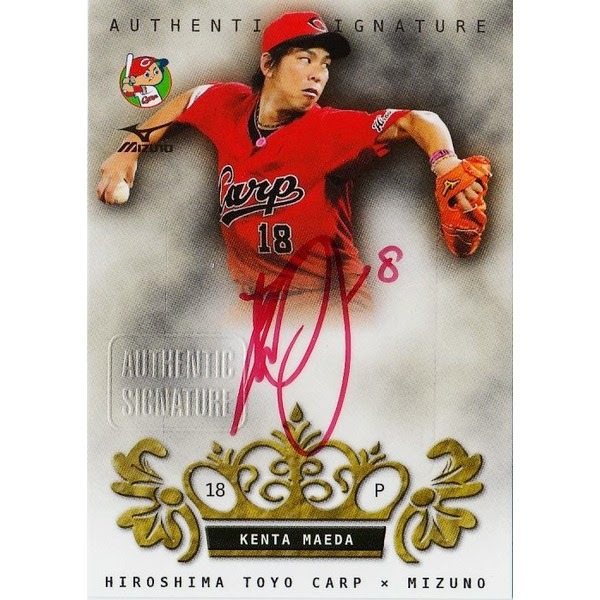 I picked up this autographed card, and I have a small desire to pick up the other premium cards from the release. Ai Okawa is a fellow former member of Idoling!!! ; the now-22-year-old joined the group in 2009. She must have been pretty popular in a hurry, because she got a card set, seen below, in 2010. The card set featured the usual costume cards, and I picked up this one with a piece of a fancy party dress. The 2015 Idoling!!! card set came out last week, so I'll have that for you in the near future. If I can keep myself in line and post every day! The name Mizuno is familiar to anyone remotely into sports. The Japanese company surely has a strong presence in its home country's sporting goods market, and can be found on many baseball players. 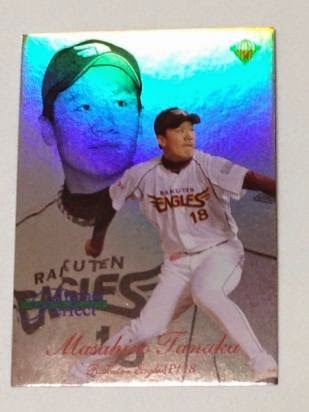 I'm not sure how the arrangement was made, but Mizuno's name has appeared on a team-based trading card set issued recently. The small base set of 15 cards features a single player on each, in an action photo of some sort. There's a fancy black crown design at the bottom with the player's name, jersey number, and position, along with the set name along the bottom. 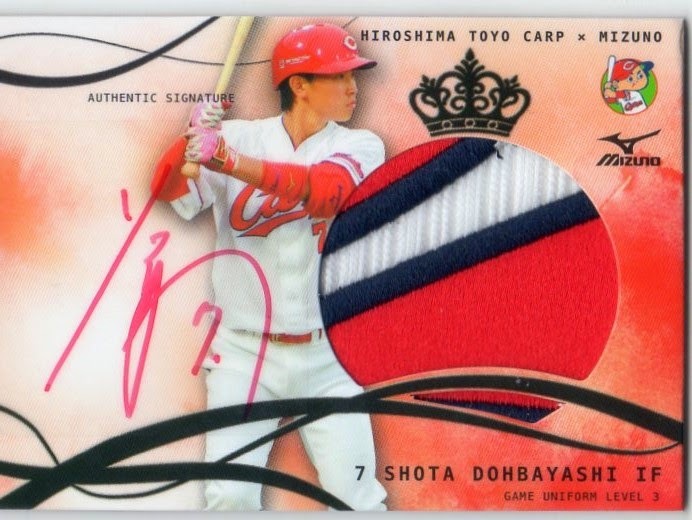 One of the top corners has both the Carp and Mizuno logos. 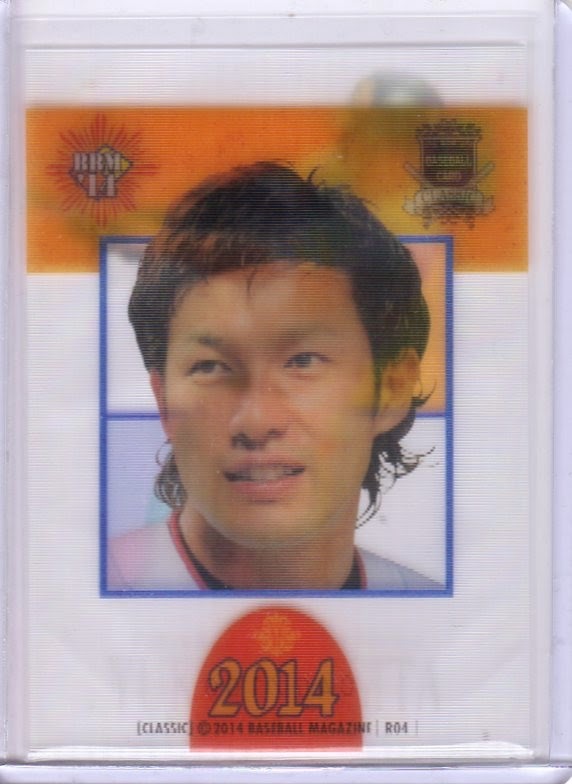 The backs have the player's name in Japanese characters; the card number is in the top-right corner. Beneath that is basic stats. The photo from the front is cropped and has a red box highlighting a piece of Mizuno equipment. 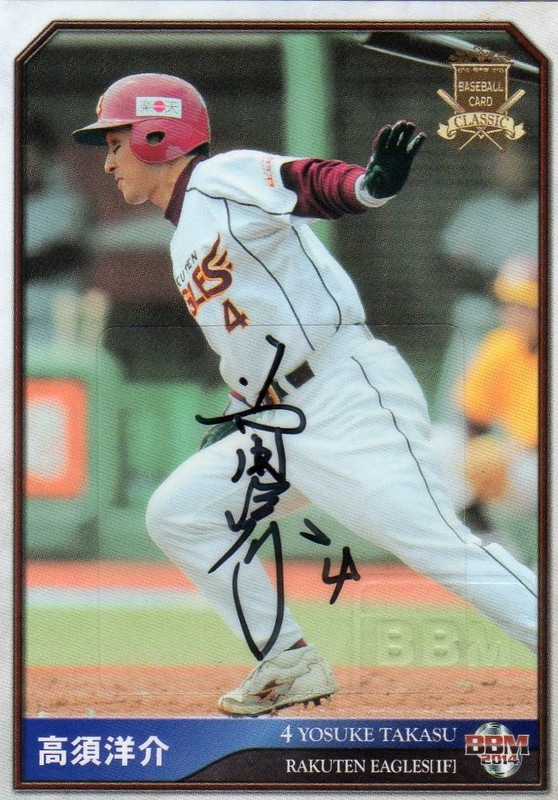 In the case of Takahashi's card above, the bat is noted. Statistics about the equipment is actually found at the bottom of the photo, above the copyright details. One thousand total sets were produced; each box contains 17 cards. 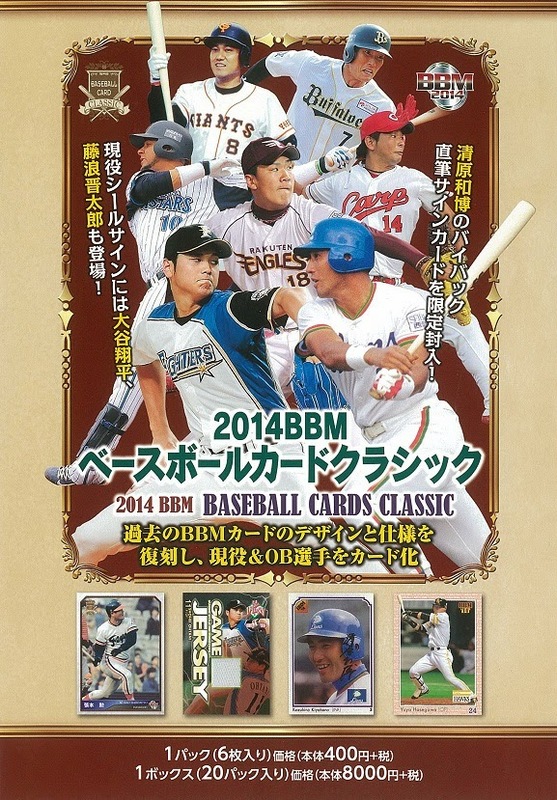 Only seven players appear on the 15 base cards; each player has two cards (Maeda gets three). One full set is in each box, along with either two jersey cards, or one jersey card and an autograph. There are three "levels" of jersey cards that can be found in the boxes. "Level 1" is just a basic jersey swatch, though the piece itself is quite large. These seem to have a print run around 255-265 copies each. 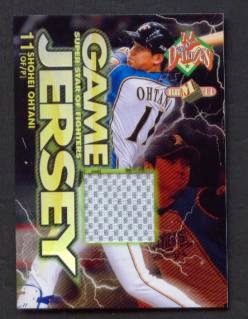 I understand that only four players have jersey cards: Dohbayashi, Kuri, Maeda, and Soyogi. Level 1 has a patch version, numbered to around 48 copies each. These are generally pieces of very large patches, similar to the patch you see in the Level 3 card below. 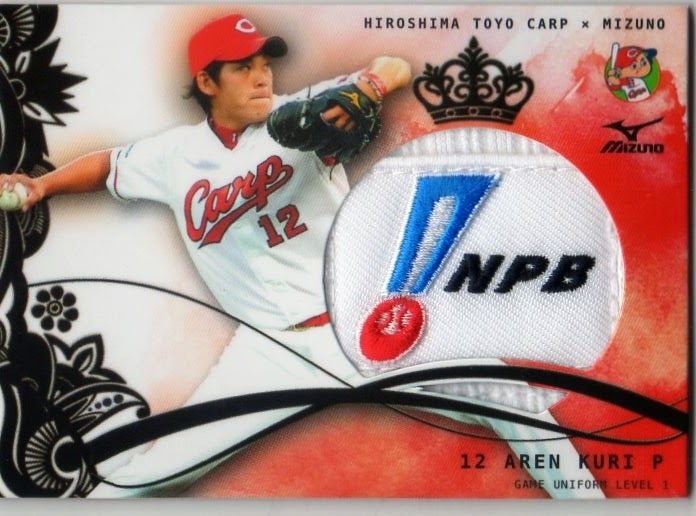 I'm not sure where this NPB patch came from, as it looks like it might be better as Level 2. But it seems that many Level 1 patches use smaller logos. Level 2 patches all appear to be vertically aligned. 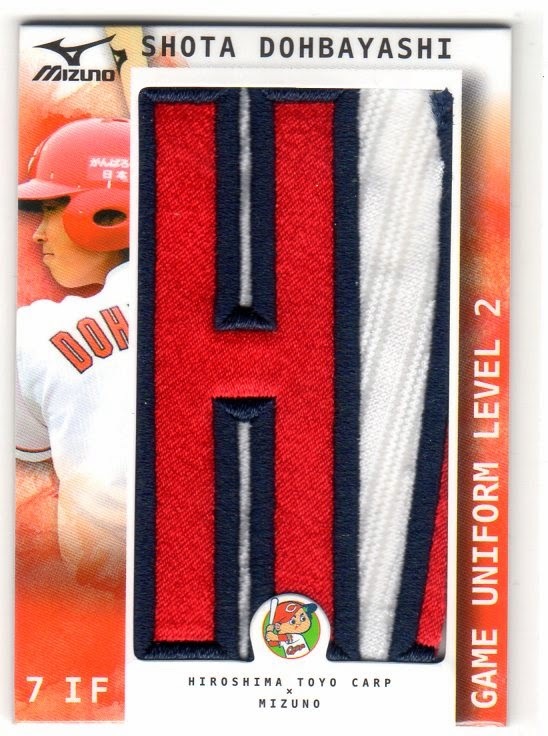 These are pretty low-numbered, and use name letter patches or the script word "Hiroshima" from the jersey sleeve. 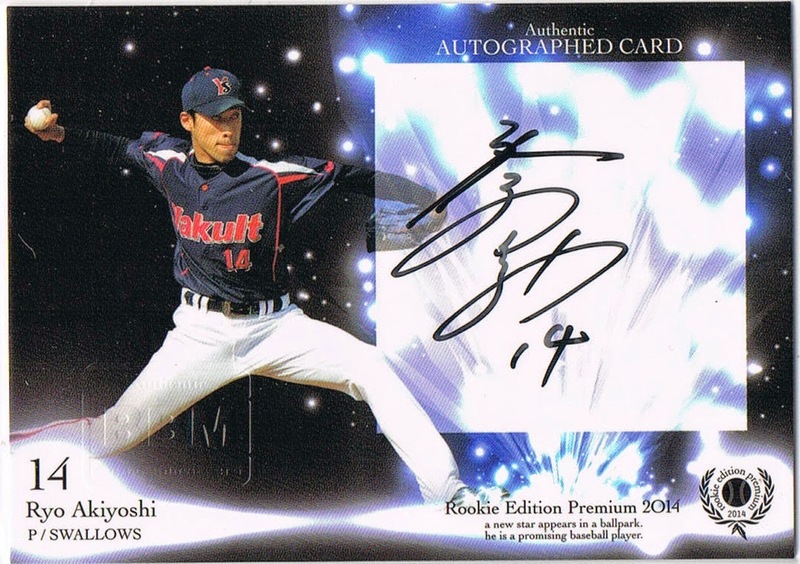 Level 3 jersey cards have autographs as well, and I think are numbered to around 6 copies each. 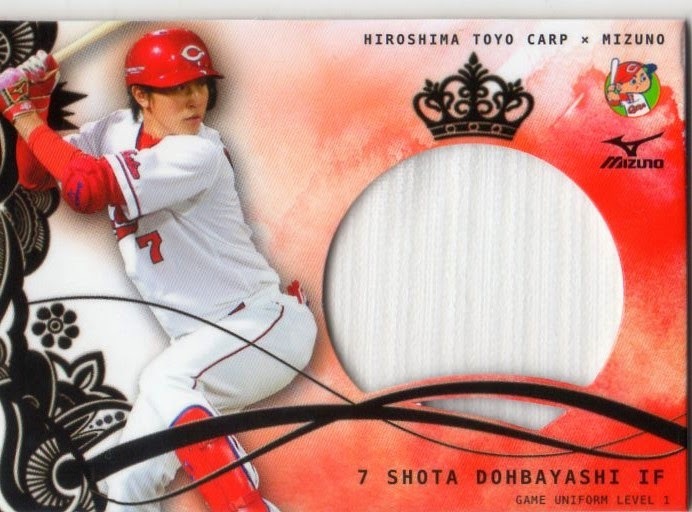 These are all patch cards, again using the large team logo patches, though I saw at least one example where the "Hiroshima" sleeve patch was used here. 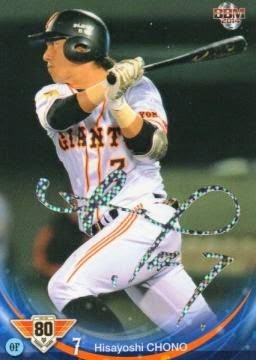 As for autographs, there are eight players who signed for the set; rookie Aren Kuri has only autographs in the product. 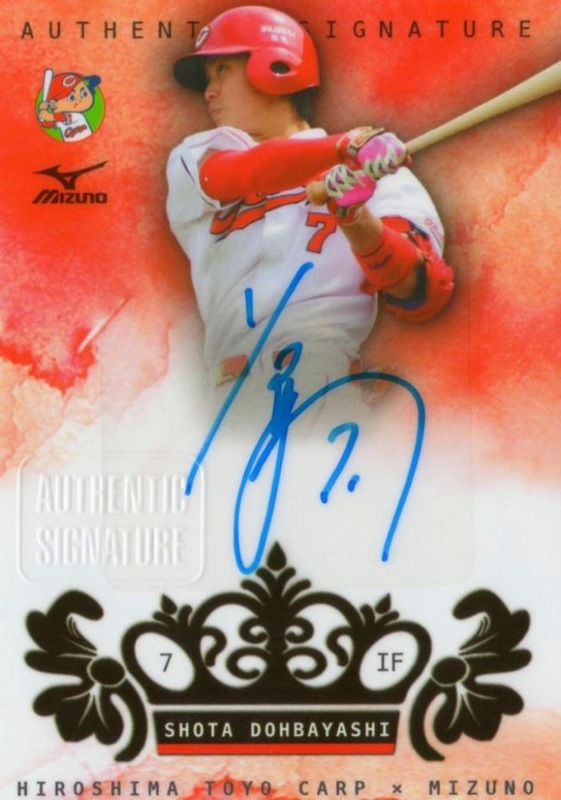 The autograph series is actually quite complicated, and appears to have two variations with three colors of signatures. The black autograph above is Authentic Signatures, while the blue version is Authentic Signatures Red, named by the background. It seems that both versions come with blue and black signatures. I can't find a full list, but it appears that quantities range from 20-45 copies each. 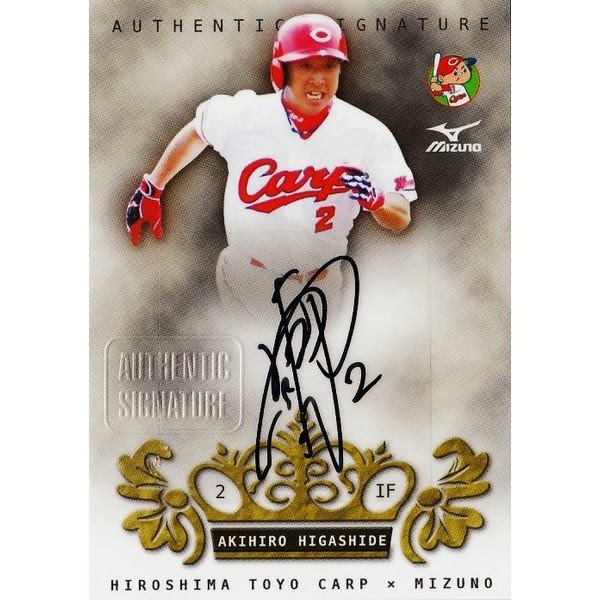 Red versions are parallels, found for both Authentic Signatures and Authentic Signatures Red. 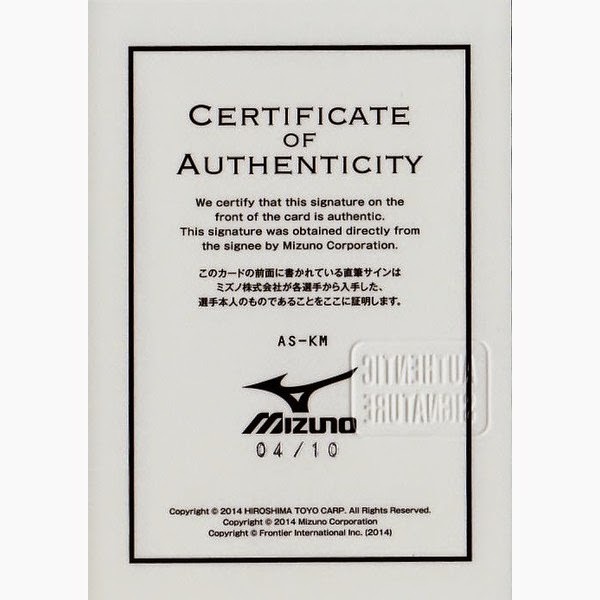 I found an image of the back of the Maeda signature, to show the serial numbering. At first this set didn't really interest me. There are just so many team sets this year. I don't generally care much for team sets, but the focus on equipment is giving me more interest. I might end up with a set in the next couple of weeks.